I am constantly amazed at the petty nature of some of supposed leaders in F1. In previous posts, I have pointed out Mosley's tendency to use insult instead of reasoned argument when answering his critics; and Ecclestone's gift for monumentally stupid throwaway comments is well known. 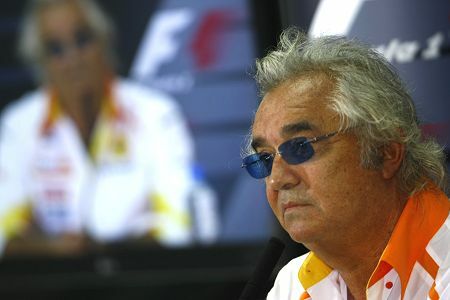 It is Flavio Briatore's angry outburst about the Honda moneys due from FOM that really takes the biscuit at the moment, however. FOTA members agreed a while back that the money due to Honda for participating in the sport last year should be paid to Brawn GP instead. This made a lot of sense, since Brawn was effectively the Honda team under a different name. But then the Flav decided that Brawn were doing altogether too well with their double diffuser (they were beating Renault, in other words) and the money should be withheld as punishment for such effrontery. What bearing the performance of a team has in such matters is beyond me, but it all made sense to Flavio as his share of the money would help to pay for a double diffuser for Renault. In other words, any team that manages to come up with a design that beats the rest and forces others to copy should have to pay for its rivals to catch up. Which may be fair competition in Flavioland but sounds more like sour grapes to me. Of course, as soon as money is mentioned, Bernie is there to see what is in it for him. Having noted that FOTA's unity on the payment had now been broken by Flavio's tantrum, he stepped in and declared that, not only would Brawn not get the money, nobody would. So the Flav's childish outburst has achieved nothing of value to Renault, although no doubt he will chortle with delight at having deprived Brawn of a little extra cash. Meanwhile Bernie passes the money on to his employers, thus ensuring that it benefits only the shareholders of CVC Holdings rather than the sport. Never mind - at least the Flav's twisted version of honor is satisfied. Say what you will about Ron Dennis, at least this kind of juvenile behavior was always beneath him. If he made an agreement, he stuck to it and would not back out if subsequent events proved it to have been against his own best interests. Perhaps that is why he was so detested in some quarters, his dignified (if wordy) statements so often showing up the tantrums of others for what they were: petty complaints motivated purely from self interest. What surprises me about Briatore is that he does seem to be able to run a decent team effort in F1, in spite of his ridiculous capering for the press. He has built and held together enough good teams to have a reputation as an effective team leader. A large part of this has been his ability to recognize talent, employ it and then assist it to championships; Schumacher and Alonso are the obvious examples. Even so, I sometimes wonder how embarrassing it must be for the more sensible members of the Renault team when the boss goes off on one of his rants. The quietly sensible Pat Symonds, for instance, must surely cringe at some of the Flav's wilder moments. Meanwhile Ross Brawn maintains a politic silence on the matter of payments to his team. Since sponsors are apparently lining up to get their names on the BGP 001, it may well be that he does not need the FOM money anyway. With Bernie making snide remarks about vested interests in Ross' leadership of the FIA's Overtaking Working Group, the payment is hardly uppermost in Brawn's mind. It will not be Ross who points out that whoever leads the OWG, the same vested interests will apply, since the committee is formed of engineers from the F1 teams; it will be left to someone else to reveal Bernie's logic as the load of nonsense it is. Oh, wait a minute - I've just done that, haven't I? Oh yes, I'll give him that - the Flav is nothing if not passionate! What prevents the Honda Motor Corp. from stepping up and saying that the money actually belongs to them because the team was under their control when it was earned? If Ecclestone took the money from any existing team, there would be unified outrage from all the teams. I don't see that this is any different. Flavio has made himself look pretty silly over the last few weeks. While Brawn was technically not entitled to the additional payment, it was not for the reasons Flavio mentioned. Besides, the agreement of the teams back in December should have been binding, as it always has been. Bernie's behaviour is worse, though. The Concorde Agreement (the only document allowing F1 to happen in the first place, lest we forget) requires that money owed to a team that does not compete in the following championship must be shared between the remaining competitors. Bernie's presumption means that he has given the teams latitude to ignore their obligations towards him, since he has now joined the FIA in having broken the Agreement's extended terms. Marc: That would be sensible in the real world but apparently the Concorde Agreement says that money due to a team that has withdrawn can be paid instead to the team replacing it, provided all the teams agree. It's a curious arrangement, considering that Honda earned the money as you say, but that's F1 for you. Alianora: It seems to me that the Concorde Agreement is or is not in force according to Max's or Bernie's whim of the moment. It is not a satisfactory situation, implying that F1 continues to happen only because the teams continue to turn up for races. All agreements are debatable and in flux, thanks to the inability of the various power groups in the sport to mend their differences, and much of the problem is caused by Bernie and Max being unwilling to compromise over what they see as their control of the sport. It is hardly the sort of atmosphere to encourage participation by the existing teams, let alone the entry of new ones. Twenty-six teams next year, hah! I'll believe it when I see it. Perhaps there is good reason why Mosley's comments are always simply insults. Flavio "throwing his toys" is quite the description, his justification reminds me of a youth soccer team laying down on the pitch simply because the other team are clearly better and they don't want to play anymore. I am incredibly pleased that Brawn GP's near-blank liveries are dominating, and I bet Richard Branson is happy too. It's a shame that this sense of reshuffling is somewhat artificial (via rule changes) but I recall reading commentaries that wanted more draconian changes than we already have... and perhaps some of those commentaries are right. Chunter: Which begs the question: would the Brawn BGP 001 have been as good had Honda stayed in the game? The only thing that would have been different would be the Honda engine instead of the Mercedes, so we have to presume that it would have been one of the best cars at least. And certainly better than the Renault! Seems I was right in predicting that the Flav would be the weak link in the FOTA chain. Would dearly have loved to be wrong, but there you have it.